Cryptologic linguists monitor, transcribe, and translate intercepted target communications; perform analysis and exploitation of designated foreign communications; and install, operate, and perform preventive maintenance of intercept equipment. 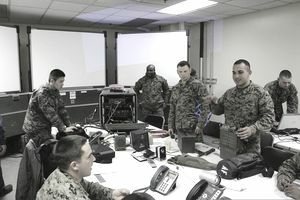 Following basic qualification as a Linguist (MOS 2711-2728), Marines attend a specialized course of instruction and upon completion are assigned the appropriate MOS. Secondary duties and tasks include aspects of EW/COMSEC and direction-finding operations. In addition, Marines assigned MOS 2671 receive MOJT in such MOS related requirements as power supply operation, equipment prime mover (truck) operation, and vehicle maintenance procedures. Intermediate and advanced language training is available. Prior to, or in conjunction with, being promoted to staff sergeant, Marines will receive Traffic Analysis training (formal school or MOJT). The Department of Defence has stated a career goal for professional linguist of achieving interagency Language Roundtable "General Professional Proficiency" (Level-3) in those modalities (listening, reading and/or speaking) required to perform his or her primary function. Cryptologic Linguists are encouraged to take advantage of language training events in order to achieve this goal. Operators need to be familiar with Electronic Warfare (EW) operations to include Electronic Support, Electronic Protect, and Electronic Attack and be prepared to contribute to MAGTF EW operations at either the team or battalion level. Knowledge within the skill set will progress from beginner to intermediate to advanced as part of their career progression. Prior to advancement to master sergeant (2691), opportunities are provided for linguists to attend supervisory-level courses in preparation for management/leadership assignments. This MOS will be assigned and voided only by the authority of the CMC (MM). (2) A Defense Language Aptitude Battery minimum score of 110 or higher, waiverable to 100, or demonstrated proficiency in the appropriate language by achieving minimum level 2 proficiency on the listening and reading portions of the DLPT. (3) Must be eligible for a top-secret security clearance and be eligible for access to Sensitive Compartmented Information (SCI) based on a Single Scope Background Investigation (SSBI). (4) Must be a graduate of the prescribed cryptologic technical course and maintain a minimum proficiency of L2/R2 on the Defense Language Proficiency Test (DLPT), in accordance with MCO 7220.52. (5) No speech or hearing defects. (6) Must be a U.S. citizen. (7) Must be eligible for a secret security clearance.